This entry was posted on 29 March 2019 at 4:00 pm	and is filed under Solving Blogs. Tagged: Ifor, Polyfilla. You can follow any responses to this entry through the RSS 2.0 feed. You can leave a response, or trackback from your own site. 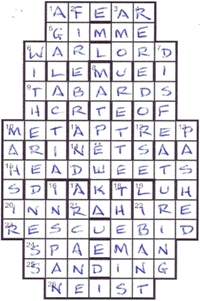 The hijrah clue had me flummoxed for a while as well — but it’s a bit of a red-herring: parses just as R=take,AH=anno hegirae. So no need to knock anything off. Thanks, Shirley. Interesting that all three of us here went for the two dots, with lack of them being the ‘preferred’ solution. Told you my Russian was rusty! Ilan, Ifor himself told me what was going on with the clue — somewhat obvious in hindsight although having got HIJRAH stuck in my head, I probably wouldn’t have seen the simple solution.